In many of EFOMP’s NMOs a local examination board has not been established. Currently medical physicists from such countries face difficulties in providing the necessary qualification evidence when they seek employment in other EU MS. In order to facilitate the harmonization of medical physics standards throughout Europe, so facilitating the mobility of medical physicists, the EEB has been established. It is not the intention of the EEB to compete with any national examination board, although a harmonisation towards a common training test is encouraged thus fulfilling the requirements of paragraph 2 of article 49b of Chapter IIIA of Directive 2013/55/EU . 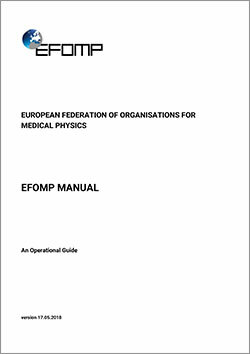 EFOMP and the three main clinical societies concerned with the application of radiation to medicine, namely the European Society of Therapeutic Radiation Oncology (ESTRO), the European Society of Radiology (ESR) and the European Association of Nuclear Medicine (EANM) have agreed on the syllabi for the training and education of medical physicists [5, 6, and 7]. In parallel, the European Commission (EC) has published RP 174 which specifies the requirements for an individual to be recognised as an MPE by the relevant national competent authorities as specified by the EU BSS . The combination of European wide standards for training and education, and European wide recognition of the knowledge, skills and competence required to work as an MP means that, for the first time, it is feasible to have a European wide standard examination to test these criteria. Therefore the EEB will award a European Diploma of Medical Physics (EDMP) as recognition that the holder is qualified to Master's degree level and has at least 2 years equivalent clinical training in the field of medical physics. It will also examine candidates against the criteria set by RP 174 and award the European Attestation Certificate to those who have reached the level of the Medical Physics Expert (EACMPE). The EEB is also dedicated to improving and expanding its Diploma and Certificate to other disciplines of Medical Physics such as MRI and Non-Ionising radiation.